Robert Anderson has been baking at Dianne’s Bakery since 1964. During that time he perfected a New England favorite, the butter roll. Rather than paint butter onto dough, Anderson devised a method of layering butter between levels of dough and baking it in a muffin tin. “They go big around holiday time,” Anderson says. “I consider them a must for slopping up gravy.” Dianne’s also offers a collection of holiday pies, apple, pumpkin and sweet potato (from a recipe he adapted from an African American colleague decades ago). At Boschetto Bakery, customers can find an array of fine cakes and European pastries from baker Joe Murphy. While the bakery sells two kinds of apple pie it is also offers up desserts that can dress up the dinner table, including the intricate and lovely apple tart, the shadow cake, a combination of chocolate and gold cake half-covered with chocolate ganache, and the Boston Cream cake. Kathy Lacher, co-owner of the Boston Cheese Cellar, which will celebrate its second anniversary in December, recommends a trio for Thanksgiving. “People usually want a soft cheese, a hard cheese, a blue cheese or a goat cheese,” she says, citing Piave Vecchio (a hard cheese,) Nancy’s Camembert (a soft cheese from New York) and Great Hill (a blue cheese from Massachusetts. Lacher customizes cheese baskets as gifts. Food for the entire Thanksgiving dinner and the rest of the season can be bought at The Village Market. Olives and feta cheese are available at the Roslindale Fish Market. The small plates of hummus or baba ganoush – known as “mezzes” – from Droubi Brothers offer an easy and affordable appetizer option for holiday parties. Organic turkeys can be ordered in advance at the Quality Meat Market. Tony DiBenedictis of Tony’s Market can ready a roast, chops or leg of lamb for a holiday dinner. Vouros Bakery is about more than baklava; its cookies are great for a party. Solera Wine Shop and Alex’s Liquors recommend American wines for Thanksgiving. Here are two items both reflecting the social conscience of Red Sox big hitters, past and present. Tonight, as I’ve mentioned previously, is the Taste of Roslindale, sponsored by Roslindale Village Main Street. 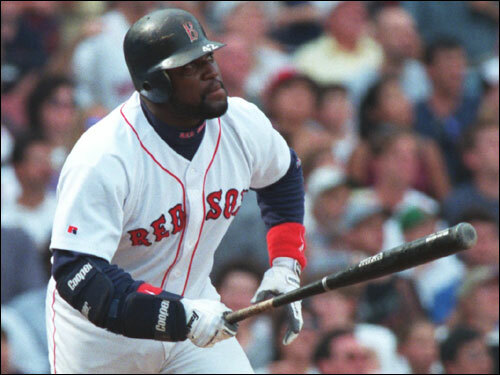 As part of the event, Sophia’s Grotto will auction off a dinner for 4 with former Red Sox MVP Mo Vaughn. I know Sophia’s will do a great job feeding Vaughn and the other guests. Monies raised will go to The Jason Roberts Challenger League, Making Strides Against Breast Cancer. Tickets for the event, which will be held at the Annunciation Church are $40 and can be purchased at the door. Meanwhile, the Boston Health Care for the Homeless Program is auctioning off a king size bed owned by David and Tiffany Ortiz. Those interested can place bids until September 30 and find more information at this link. I am a tremendous fan of the restaurants in Roslindale Village. At times, however, this leaves me with a problem, sort of a culinary prisoner’s dilemma: Do I stop into Sophia’s Grotto from the Spanish antipasto and open faced ravioli or head over to Geoffrey’s for the chicken saltimbocca? Now, at least for one night, September 18, I won’t have to torture myself with food scenarios. Many of my favorite eateries will all be under one roof, that of the Annunciation Church on VFW Parkway for the 2nd Annual Taste of Roslindale. Some of the others participating will be Boschetto’s Bakery, the Birch Street Bistro, Bangkok Cafe and Fornax Bread Company. The event will also feature its own version of a Throwdown called a “Butcher Block.” Mayor Menino and Vinny Marino of the BrickHouse Cafe in Dedham will battle Roslindale’s Charley McCarthy and WCVB’s Susan Wornick in a unique food demonstration. Doors open at 6:30 p.m. and tickets for $40-per-person can be purchased upon entry. I’m a board member of the Roslindale Village Main Street, which is sponsoring the event, with proceeds to benefit the Jason Roberts Challenger Little League Baseball and Making Strides Against Breast Cancer. I file a column for the Roslindale Transcript about the neighborhood’s great eateries in my capacity as a Roslindale Village Main Street board member. Fortunately, Roslindale Village provides a roll of restaurants, bakeries and food shops, which itself reads like something out of a travel guide. There are specialty shops to purchase fresh meat and cheese, more than five bakeries to procure warm bread, pastries and cakes and restaurants to dine indoors or outside along with a wine shop. Adam’s Park in Roslindale was the scene of a rousing celebration of America and her flag. Hundreds of elementary school children gathered in Roslindale Village to mark the occasion of the flag’s birthday. The students reflected Boston’s ethnic, racial and religious diversity. They were both immigrants and native born. They all cheered the American flag. The students sang the National Anthem and marched out of the park to the themes of the armed services. The above American flag is the work of famous Hull artist Seth Minkin, who has been featured on CBS’s Sunday Morning show. His work can be found here. A contrast to what happened in Roslindale can be found in my story from last week about the commissioning of Harvard’s ROTC cadets. In light of the recent Kosovar declaration of independence, I have a local observation. Roslindale is home to a large Albanian community, including many Kosovar Albanians, who can be found each morning at several local coffee shops. The graffiti, “KLA,” can be found on the wall of the former Friendly Ice Cream on Centre Street in West Roxbury. My guess is that this tag refers to the Kosovo Liberation Army. I’ve never been a huge fan of Thanksgiving Day toasts. The important thing about the holiday, to me, has always been just being together. And eating lots of turkey. But I happened into an experience today that puts all of our lives here in America in perspective. It happened in an unexpected place. My backyard. I got into a conversation, as I sometimes do, with my next-door neighbor. I don’t want to get into too many personal details. It’s enough to say that he’s in his mid-seventies and Polish. Today he had a lot on his mind. Speaking from the second floor porch of his three-decker, he started to tell me about his last visit to Poland. Maybe two or three decades ago. He arrived at night and arose early the next morning to go for a walk. He walked by the Vistula River near which he was born. He passed the infamous spot of the Warsaw Ghetto. And finally he made his way into the very same pew in the very same church where as a small boy he had received his first communion. Of course, that had been prior to the division of Poland, prior to its invasion by the Nazis, and prior to the whole circuitous course of events that eventually brought him to Poplar Street in Roslindale. The way my neighbor tells the story, everything came out. He recounted his memories of receiving communion in that seat. Then he told how he had watched the Nazis demolish the house his aunt lived in and replace it with a 16-foot wall to be topped off with barbed wire. Inside the wall, the Nazis would put the Jews, an area that would become known to history as the Warsaw Ghetto. Later his mother would find ways to bring food and supplies into the city for Poles and Jews. When the husband of a local Jewish woman was executed, his mother told his family that they would be her family. She hid them for the remainder of the war. He spoke of the largely forgotten revolt of Warsaw in 1944. As a young, nimble teen, he could fit through narrow cracks in basements and bring ammunition to partisans. There, they struggled as Stalin ordered his army to remain safely on the other side of the Vistula until the Nazis mopped up anyone who might cause them trouble once they took over. With the tragic defeat, the Nazis took his family by train to Essen, to work camps. His father and sister toiled as slave laborers in the train terminal. He worked to survive as well. There was more, some of it jumbled. Friends murdered. Names of those who collaborated. What a way to spend your teenage years. Finally, the Americans came, a group of African-American soldiers, who brought them to safety behind the lines. When you see the three-family homes that line many of Boston’s streets, you don’t know the stories that live behind the walls. There are the images that hint at things – the red and black Albanian flag on Belgrade Ave., the state banner of Poland paired with the American flag, a gold star on a home. But you never really know. In this one story from my neighbor on Thanksgiving Day, I got a sense of everything we have to be grateful for to live in this country. I am back and can immediately report on a bit of local news. The restaurant Salute, on Washington Street in Roslindale, is now called Geoffrey’s. Geoffrey’s, according to its new management, will be a “New American Bistro”. The grand opening will be today at 4 p.m. From a quick glance of the menu, it looks like the entrees are in the $14 range, which is less expensive than its prior incarnation. The menu also seems to be a move away from Italian, which is a good thing given the neighborhood’s relative abundance of fine Italian restaurants. They will also offer a weekend brunch menu, which is something the Square could use. Also, there is news about Bangkok Cafe. Bangkok Cafe hired the former chef of Jamaica Plain’s Wonder Spice Cafe, and the new chef has had an immediate impact. The restaurant appears to be more busy, and the menu — which now has pan-Asian offerings — is more tasty. I will have an item on Israeli food later this week.